Recently refurbished, the 7 Grains Bakery not only bakes bread and cakes but also has a pleasant coffee shop and sandwich bar. Located across from the city's bus station at 31 Palmach St., the bakery has drop off and pick up parking outside, so you can phone in your order and quickly come by to collect it. Of course if you prefer you can stop in and have a coffee while you decide which of the delicious cakes and pastries to take home. Popular with everyone in Safed, 7 Grains is the place to buy whole and multi-grain challahs for Shabbat. With a range of breads from the signature 7 grains: - whole-wheat, rye, and a variety of mixed grains including oats; 100% wholewheat; dark with no sugar or salt; diet bread:-high fiber, low calorie; wholewheat pita as well as white pitas and rolls, you are certainly spoiled for choice. Prices start at 15nis for a loaf of bread, with special break like raisin challah for Shabbat costing 17nis. The bakery offers both large dairy and parve cakes starting at 60nis for parve cakes up to 130 for a cheesecake, as well as swiss rolls (40nis a kg), rum babas (15nis each) and profiteroles at 2nis each. They also bake personalized birthday cakes to order from 60nis for parve to 97nis and up for cream cakes. The most popular pastries are the rughalach, with the potato and cheese pastries coming in a close second. There is the usual bakery choice of parve cinnamon rolls, chocolate croissants, vanilla snails, etc..., as well as a good dairy selection of savory cheese puffs, mini pizzas, and sweet cheese pastries. Prices start at 28nis a kg though of course you can buy just one pastry! Sandwiches are made fresh to order, and you can choose from egg, tuna, yellow cheese, feta or the most popular choice, cream cheese, with a selection of salad fillings. Prices for sandwiches start at 15nis. All sandwiches can be toasted upon request. If you come in the mornings, you can be sure of a friendly welcome from the affable Mordechai Yisrael. Originally from England, he will make you an excellent cup of the renowned Italian Lavazza coffee and perhaps give you his opinion on the topic of the day. Coffees start at 7nis for espresso to 12nis for a cappuccino, and you can always indulge yourself with one of the delicious pastries on offer for a few shekels more. As everything is prepared and baked from scratch on the premises every day, the bakery delivers orders to lots of businesses and hotels in the Safed area. The hotels include the Canaan Spa, The Rimon Inn and the Villa Galilee. If your group is staying in the area, the bakery can arrange to deliver your choice of sandwiches, cakes, pastries and bread to you with 24hrs notice and a minimum order 200shks. 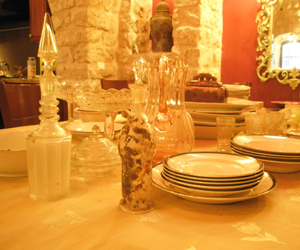 If you prefer, or you are not staying in Safed, you can arrange to pick up your order on your way in or out of Safed. The bakery is open from 6am to 8pm Sunday thru Thursday and until 2.30pm on Fridays. Closed on Shabbat and Festivals. Kosher certificate: Mehadrin. N.B. All ingredients have the Rav Landau or Edit Haredit hechsher.